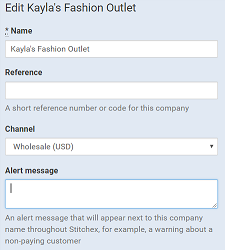 As a Wholesaler for a brand, your customer database in Stitchex contains company details for your retailers - whether they are purchasing from you in-person or on your showroom. Your customer database includes their addresses and individual contact details. It's also where you can find transaction details relating to particular customers, such as historical sales and open credit notes. Note: Your customers may also include direct-to-consumer contacts on Shopify or WooCommerce. In this case, our integration can bring those orders into Stitchex. See our integrations Article for additional information. Each customer you add to your organization has some basic details (name, location, website etc) as well as default settings for any sale created for that customer, for example, the default payment terms and invoicing method for the customer. In addition, each customer can have any number of sub-entries for people associated with the company. For example, billing contacts, delivery contacts or buyers. 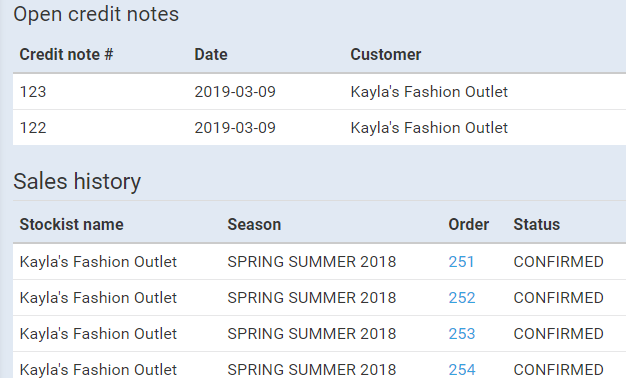 Finally, customers can have multiple addresses that can later be selected as billing or shipping addresses during the sales process. Select Customers from the sub-menu as shown in Figure 1 below. Enter the basic customer details (only name is absolutely required) on the form as illustrated in Figure 2 below. Click the "Create Company" to add the customer to your organisation. You'll then be redirected to the customer details page from which you can add details for individuals at the company or billing/shipping addresses. 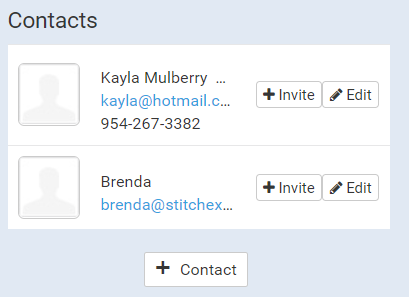 Stitchex also lets you enter contact and address data during the sales workflow, so it isn't strictly necessary to enter all of your customer data before getting started entering sales. You may, however, have an existing spreadsheet of contact data that you want to import. 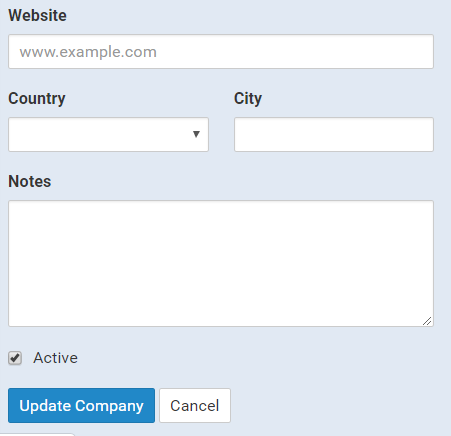 You can also specify "tags" for your customers to help locate them more quickly in the future. See our Tags Article for additional information. Note: Currently, you cannot delete a individual contact that has been referenced from a sale or purchase order. Repeat steps 2 thru 4 until you have all contacts entered for this customer. Click the Edit icon if you wish to make changes to that customer contact information. These contacts will be displayed for you when you are creating a Sale. You can choose whether they are Billing contacts or Shipping contacts. Repeats steps 2 - 4 until all addresses have been entered. 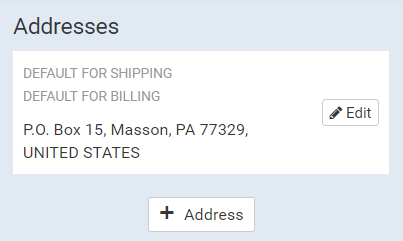 Click the edit icon to make changes to an address. When building a sale, you will be prompted to select address and contact data to fulfill various roles in the workflow (such as a customer's shipping contact or billing address). Be aware that when selecting an address, Stitchex copies the address to the sale. Therefore, updating the address in the customer database will not automatically update the address on the associated sales. 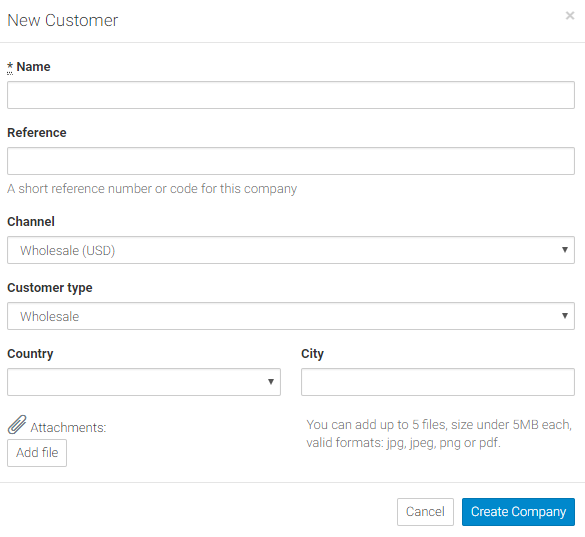 This makes it possible to override or adjust addresses on a sale by sale basis. It also preserves existing data in the sales database even if your customer's addresses change. In contrast, when associating an individual (a person) with a sale (for example, the buyer), Stitchex doesn't make a copy of the contact data (phone number, email etc) and always shows you the latest data from the customer database. Link "Agents" to your customers. Agents are people that have an Agent subscription and share access to your company data. The Agents are setup under Settings>Users & Permissions. You can override the Xero nominal accounting code to use for invoices for specific customers. Select the account code you want to use with this customer that will sync to your Xero Accounting software if you have Xero integration enabled. Use the Default percentage discount if you always want to give a specific customer a special discount. Also, use default card fee percentage field if you want to charge an increase for processing their credit card transactions. Specify your customer's courier name and account number. As noted, this information will be displayed on all Sales Order paperwork. The default tax level is set per customer as the rate could be different for each customer. The tax percentage defined in this field is the amount that is added to all customer invoices and is shown on all other documents for that customer as well including their sales orders, returns and credit notes. You can control the "label" associated with this tax rate under "Settings>Paperwork". As examples, you may want to call it VAT Tax or "Federal and State Tax" or "Customer Tax and My Company Sales Tax". Otherwise, the default labeling on documents will just say "tax". See our Paperwork Knowledge Article for additional information. Also see our Tax Home Currency Knowledge Article for more information on how and where that tax is applied. The Due Date field for Invoices is automatically calculated for invoices based on what is set as the default under Settings>Invoices in Payment Terms. The Payment Terms defined within the customer profiles do not calculate due dates. They are only displayed on the paperwork. Use the edit invoice method to manually override an invoice due date if it needs to be different than the Payment Terms defined under Settings>Invoices for a particular invoice. Specify which Warehouse you want to use for primary product distribution for this customer. Specify your customer's website, country, city and other notes about your customer that may be helpful in conducting business with this customer. Apply Customer tags to quickly locate your customer or classify them by type. See our "Managing Tags" Knowledge Article for more information. Your customer may have "favorite" products they order from you on a regular basis. You can add these to your customer profile so that you do not have to search for them when your customer places orders. This feature works very similar to the "Related Products" feature on Products. See our Knowledge Article on Creating/Editing a New Product. Scroll down to the Favorite Products section within your customer contact. Browse for a Select the Product. Repeat steps 1-3 to add as many favorites to your customer profile as you would like. See all Open Credit Notes and Sales History for this customer. Click on any of the Credit Notes or Sales Orders to gain visibility into further details about that transaction. You can also launch a New Sale for the customer from this page below Sales History by clicking "New Sale".